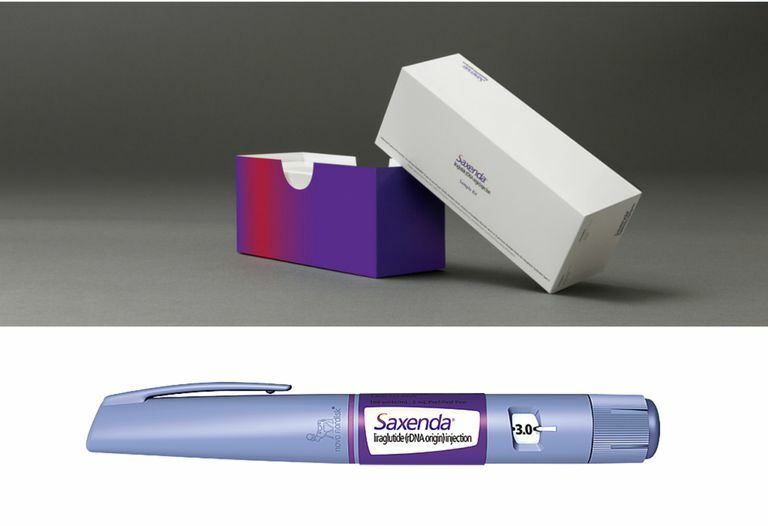 If you need to lose weight, you may want to learn more about Saxenda, an injectable weight loss drug. The product isn't right for everyone but research studies have shown that prescription weight loss injections may help you reach and maintain a healthier weight. Saxenda (liraglutide [rDNA origin] injection) is a medication that helps your body to feel full sooner after you eat. This may help you to eat less overall. The medication comes in a pre-filled pen and is injected into your body once each day, at any time of the day. If you take Saxenda, you'll work together with your physician to reach the correct dose, up to 3 milligrams (mg). Saxenda can be used by patients who are obese (with a BMI of 30 or more) or by patients who have a BMI of 27 or more and a weight-related medical condition such as type 2 diabetes, high cholesterol or high blood pressure. Patients who take Saxenda should also be ready to commit to lifestyle changes, including a healthy diet and exercise program. .Some patients should not take Saxenda. These include patients who are pregnant, patients who have had any prior serious reactions to liraglutide or any of its components and those with a personal or family history of medullary thyroid carcinoma (MTC) or multiple endocrine neoplasia syndrome type 2 (MEN 2). You should also avoid taking Saxenda if you are taking another GLP-1 receptor agonist or if you use insulin. Saxenda and another common medication called Victoza (prescribed for the treatment of type 2 diabetes) have the same active ingredient, liraglutide. Victoza provides a lower dose of liraglutide. The two medications should not be used together. You should talk to your doctor to make sure Saxenda is safe for you. Your health care provider will evaluate your health history and your medical conditions to decide if you can use the medication and if it is likely to improve your health. It's always tricky to estimate how much weight you can lose on any medication. Your actual weight loss with liraglutide will depend on several factors including how well you tolerate the medication and how well you stick to a low-calorie diet and exercise program. But recent research studies will give you an estimate of how much weight was lost by other patients taking Saxenda. In clinical trials, patients who chose this type of weight loss injection lost more weight than those patients who took a placebo. The patients who were studied took the medication for a year and also received counseling to promote diet and exercise lifestyle changes. At the end of the study, 64 percent of patients without diabetes lost at least 5 percent of their body weight, while only 34 percent of those taking a placebo reached that goal. In patients with diabetes, 49 percent of patients treated with Saxenda lost at least 5 percent of their body weight compared with 16 percent of patients treated with placebo. If you currently weigh 250 pounds and you take Saxenda, you stick to a low-calorie diet and you exercise on a regular basis, it's possible that you could lose 12.5 pounds or more. But keep in mind that you would need to continue your healthy lifestyle to keep the weight off for good. Makers of this injectable weight loss drug provide a support system called SaxendaCare. Patients who enroll in the program get access to additional information, coaching support, weekly emails and dosing support to help them reach their healthy weight goals. In clinical trials, the most common side effects observed in patients treated with Saxenda were nausea, low blood sugar, diarrhea, constipation, vomiting, headache, decreased appetite, dyspepsia, fatigue, dizziness, and abdominal pain. In addition, some patients who took Saxenda reported serious side effects including pancreatitis, gallbladder disease, renal impairment, and suicidal thoughts. Saxenda can also raise heart rate. You should stop taking it if you notice an increase in your resting heart rate that continues over time. However, your treatment may be covered by your insurance company. You can call your insurance provider to see if the medication is covered on your plan, or you can visit the Saxenda website and use their copay tool to get an estimate. You may also be able to benefit from the Saxenda Savings Card. According to promotional information, some users are able to pay as little as $30 or save up to $200 per prescription. Keep in mind, however, that there is a maximum benefit of $200 per prescription and 12 benefits annually. Be sure to talk to your doctor about how long you will need to be on the medication so that you can calculate the real cost of the treatment over the long term. FDA Briefing Document. " FDA Briefing Document NDA 206321 Liraglutide, 3mg." September 11, 2014. FDA News Release. “FDA approves weight-management drug Saxenda.” U.S. Food and Drug Administration. Saxenda Medication Guide. Novo Nordisk.